Version 2.1.2 has been submitted to Google Play, Amazon, Windows, PlayBook and to the upcoming Blackberry10 touch devices, to be launched later this month. The new version fixes MIDI connection problems some people were having with their devices, so let me know if there are still outstanding MIDI issues. I'm hoping that's the last bugfix build for 2.1, and I can focus on getting 2.2 out ASAP. Looking for a little distraction from composing? 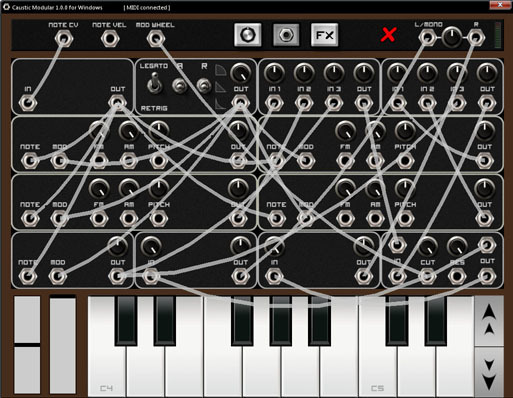 Fellow KVR'ian Aldo Calpini has posted his first Android app and it's dedicated to synth lovers. 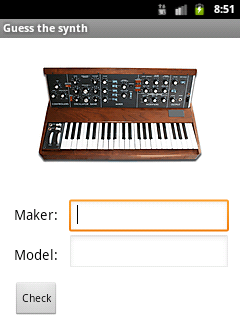 It's a quiz where you have to name the synth model based on a picture that's shown on screen. I'm terrible at identifying vintage synths but I did get a few right! How many can you name? Check it out, it's a straight APK download from his website, with no Android permissions required. I've just submitted Caustic 2.1.0 to the various app stores, so it should be trickling in over the next few hours/days depending on your platform. I've also updated the Windows version to the latest version. A new website has been launched by the creator of the popular iDesignSound.com devoted to Android music apps. Maybe it's not the smartest business move for me to lead you to others apps, but I'm confident in my product and Alex deserves some recognition for the great work he's done setting it up. I didn't write this especially for release. I've always had a win32 version of Caustic used for debugging (debugging on the Android device is slow and painful so I only debug on device intensively before release). So what you're getting is the exact same app as on your portable device, quirks and all. Although it has been out for over a week now, I just thought I'd mention here that Caustic is now available on BlackBerry's tablet. The PlayBook is a really slick tablet, and can be picked up for pretty cheap in most parts of the world. The performance is great, the latency is low (~16ms) and the OS is really nice once you get used to it (coming from Android). 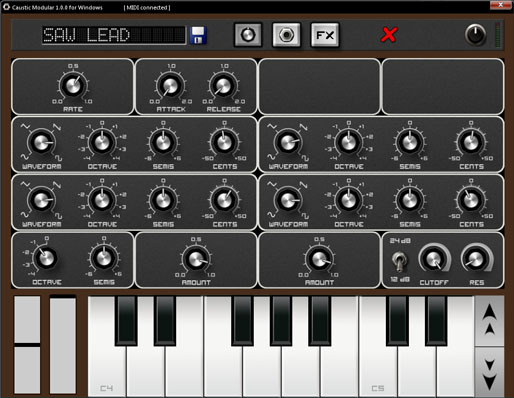 Caustic 2 is available as a free demo and full/paid version on BlackBerry AppWorld. A big welcome to those coming here from their PlayBook, I invite you to register and join in on the forums. Update - 15 June 2012: It seems as though AppWorld is refusing to publish the "Community Content Pack" installer because it's not a "real" app. So I"m offering it via this website in the meantime. Download the ZIP file, connect your PlayBook and open it as a USB device, browse to the misc/caustic/ folder and extract the ZIP contents there. The content should then be available through the app in "community1" folders in both the demo and paid versions. This also means it will be harder to get 3rd-party content packs over from the Android market as well. Zvon have put their stuff on a dedicated PlayBook page here, with instructions.